Back then, the Emancipation Proclamation was just one of the things I've read in history textbooks, I never knew there was a Preliminary Emancipation Proclamation before that. When I learned that the New York Public Library was offering a free four-day exhibit of the document, I readily signed up. 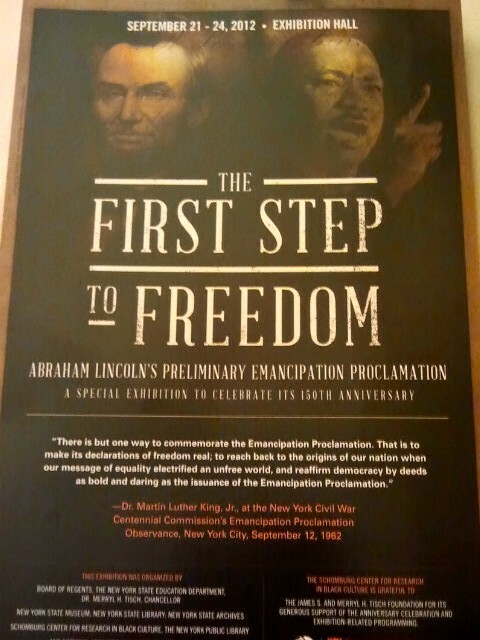 The Preliminary Emancipation Proclamation was signed by President Abraham Lincoln on September 22, 1862, and exactly 150 years later, I was viewing the document at the Schomburg Center for Research in Black Culture in Harlem, upper Manhattan. The exhibit featured both the handwritten draft of President Abraham Lincoln, and the Official document from the National Archives in Washington, DC, which was transcribed from the draft by a professional scribe and signed by the President. The exhibit also included a few pages of the draft of the speech of Martin Luther King, Jr., which he gave a few days before the centenary of the Preliminary Emancipation Proclamation. 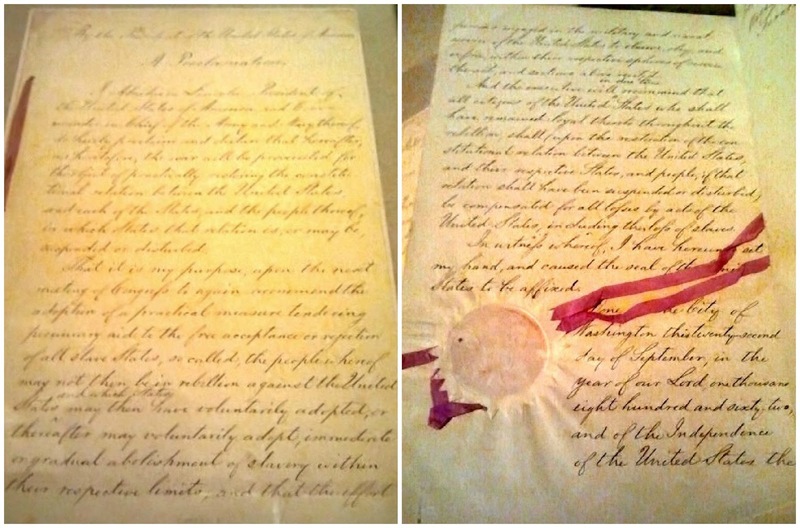 The handwritten draft I was viewing was probably written by President Lincoln months before, since in July 1862, he read his "preliminary proclamation" to his Cabinet. The President then decided to wait for a Union military victory to issue it and on September 22, 1862, following the victory at Antietam, he signed the preliminary Emancipation Proclamation. The document formally alerted the Confederacy of his intention to free all persons held as slaves within the rebellious states. One hundred days later, on January 1, 1963, President Abraham Lincoln issued the final Emancipation Proclamation. To get to the exhibit, I took the 2 train to 135th Street in Harlem. Coming up from the subway I saw a familiar structure. It's the Harlem Hospital Center where my sister has worked for the past 30 years. The Schomburg Center is right across the hospital. When our appointed time came, we were first led to a room where we watched a clip about the history of slavery in the US and what happened after the emancipation. After the video clip, we were led to the second floor where the exhibit was held. The opening of the United States Declaration of Independence, written by Thomas Jefferson in 1776, states as follows: "We hold these truths to be self-evident, that all men are created equal ..."
However, the above statement did not hold true for people of African descent who were brought to America as enslaved laborers during the colonial period. The boards that people were looking at in the above pic further explained the history and, ultimately, emancipation of slavery in the country. As the country developed, more and more slaves were needed to clear the lands and produce crop. The first board expounded on the history of slavery in the country while the second one contained a write-up about the resistance from the slaves as most of them refused to accept their circumstances, and some even tried to escape. Here's a close-up of the right-most pic on the second column. The next two write-ups dealt on the civil war and emancipation of the slaves. The Sectional Conflict board expounded on the conflict between the northern states and the southern states who needed slaves for their cotton plantations. Shortly after Abraham Lincoln was elected, the southern states began seceding from the Union as Lincoln was determined to abolish slavery, and thus the Civil War began. After issuing the Preliminary Emancipation Proclamation, President Lincoln made good his word and on New Year's Day 1863, he signed the Final Emancipation Proclamation. As further explained on the Emancipation board, some of the freed slaves enrolled in the military service, and thus helped win the war for the Union. It also forced the question of citizenship for blacks in the national agenda, which lead to the 13th amendment to the Constitution. The next two boards were End of the War and Reconstruction: Presidential and Congressional. After Lincoln was re-elected in 1864, he made sure his party called on Congress to secure the formal abolition of slavery (leading to the ratification of the 13th amendment), The war dragged on until General Robert E. Lee surrendered in April 9, 1865. Six days later, President Lincoln was assassinated. The aftermath of the war and beginning of emancipation lead to turmoil in the succeeding years as slaves began to demand equality, especially the right to vote and equal access to schools, transportation and other public accommodations. The other board, Reconstruction, focused on the conflict of President Andrew Johnson with a Republican-controlled Congress over what a "reconstituted" South should look like. Between 1866 and 1869, Congress passed civil rights laws and the 14th and 15th amendments to the Constitution. Then came Reconstruction and Education, The Reconstruction board expounded on the role of the churches in the black community, as well as blacks being voted into public office. The Education board stressed the importance of the slaves knowing how to read and write as most of them were illiterate. Over 3,000 schools were established in the South to accommodate the freed slaves. But it wasn't smooth sailing after the Reconstruction. Blacks faced unemployment inequities and housing segregation as civil liberties eroded in the succeeding years. In 1909 the National Association for the Advancement of Colored People (NAACP) was established in New York, as well as several other organizations catering to the improvement of the black community. After World War II many African-Americans, who served during the war, began to seek courses of action against racial discrimination and injustice in the country. In 1963, during the centennial anniversary of the Emancipation Proclamation, Dr. Martin Luther King, Jr. spoke of the importance of the Proclamation and that it proved that government could be a powerful force for social justice. Part of the exhibit were some pages of the draft of the speech of Martin Luther King, Jr. which he gave in September 1963. The last board talked about Looking Toward the Future, and expounded about the achievements of modern civil rights, how the African-American community won back the rights promised to them - the vote, equal protection under the law, and the eradication of segregation. President Lincoln's handwritten draft of the Preliminary Emancipation Proclamation is the only surviving copy of the document in the President’s hand. An excerpt from the brochure handed out to us .. In 1864, Lincoln donated the document to the U.S. Sanitary Commission, which raffled it off at the Albany Relief Bazaar to held raise money for the Union war effort. Abolitionist Gerrit Smith won the raffle after buying 1000 tickets at $1 apiece. Smith then sold the document to the New York State Legislature, with funds going to the Sanitary Commission. The legislature, in turn, deposited the document in the New York State Library, where it remains today. The documents were placed in a temperature controlled box but you can read each page. I took pictures of each page but they are not as clear. I'll post my pics here but will give you a better link so you can read the document in President Lincoln's own handwriting. You can view the transcription of the document on this link. 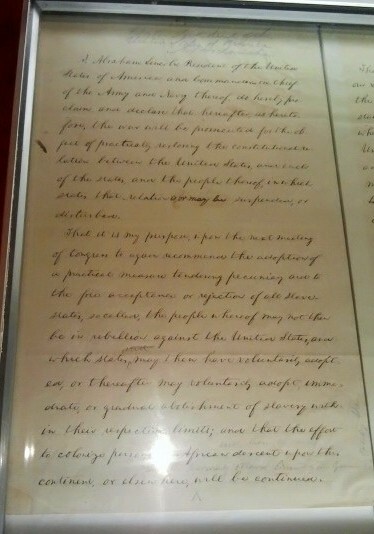 Here's the Official Preliminary Emancipation Proclamation from the National Archives ..
Lots of lessons learned on this exhibit, I'm so glad I came. I hope this country produces another Abraham Lincoln, such a great, great man. After the documents is this simple picture of President Lincoln, taken just a few days before his assasination. While this picture hang on the wall near the documents. Coming down from the exhibit, I spied this African tribal mask near the lobby of the building. I then went down the subway to go back to midtown. At the station is the tile mosaic Harlem Timeline, a tribute to famous African-Americans and Harlem luminaries. Here are a couple of pics. After the exhibit, I dropped by for a walk in Central Park. It was the first day of autumn and the air was a little nippy. Near the North Meadow, some of the leaves of the trees were already changing color. I welcome it, though, I love the changing of the seasons and consider myself lucky to experience it here in New York. 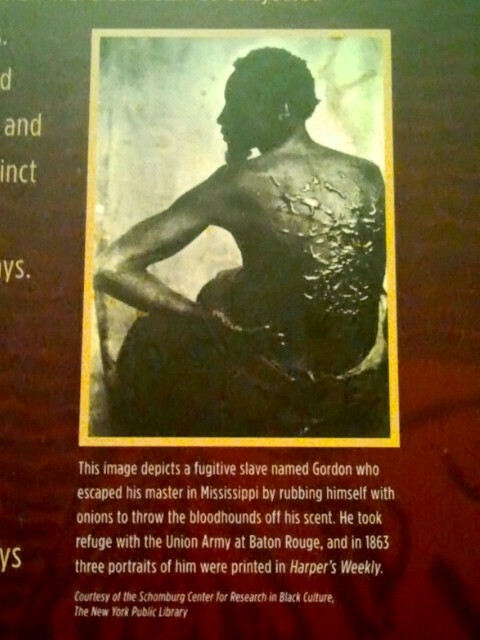 And I think of the enslaved laborers of centuries ago. Somehow, they might have felt lucky, too, seeing the seasons change. I would like to think the changing of the seasons for them meant hope for a better future for their children. Last Tuesday, names were once again recited and bells tolled for the victims of the September 11 attacks. It has been eleven year since and I'm proud to see One World Trade Center rising up and standing tall. 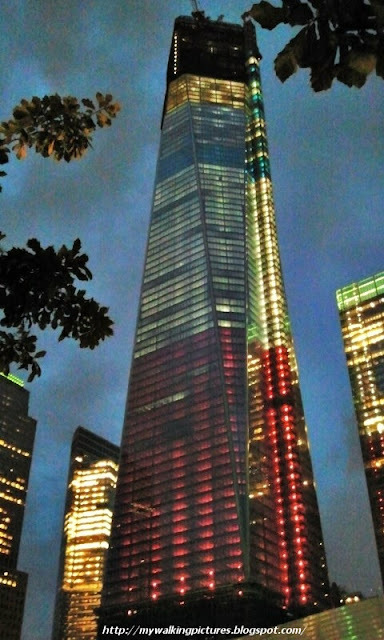 I was at the National September 11 Memorial last weekend and the building was lit in red, white and blue to commemorate the anniversary. The memorial was opened to the public just last year. 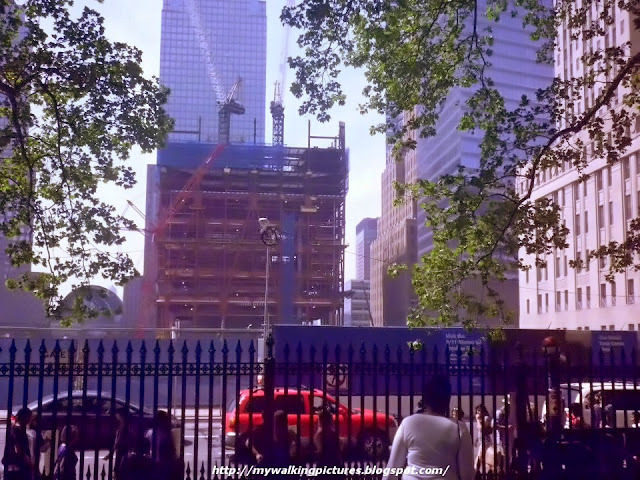 Before that you could only see the construction from behind the fence or from the pedestrian walkway linking the site to Battery Park City. 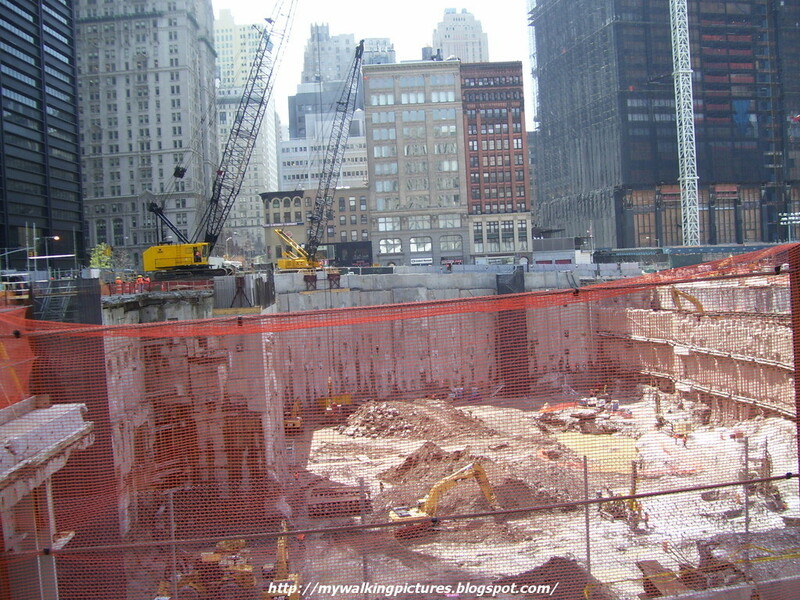 The earliest pic I have of the construction was in April of 2008. At that time the land has already been prepared for the foundation of the buildings. You can see the timeline for the reconstruction of the World Trade Center area on this site. 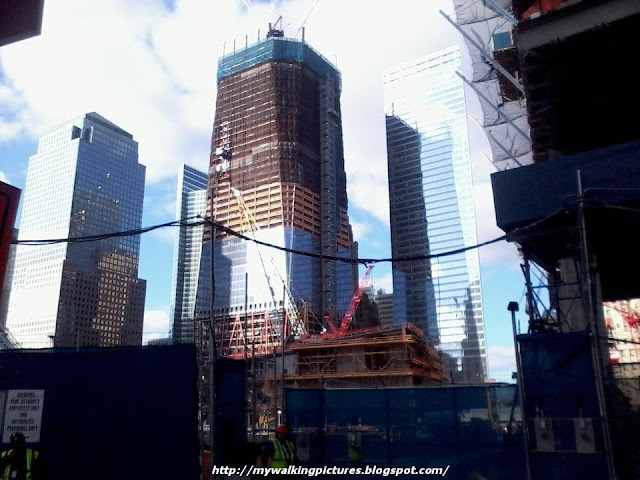 Two years later, in May 2010, One World Trade Center was taking shape. 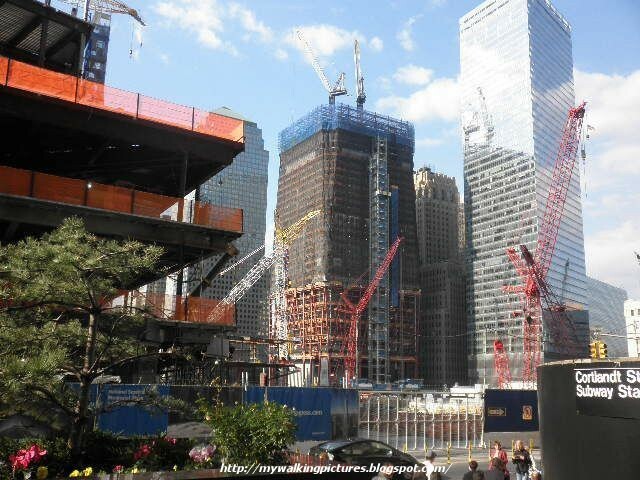 By October 2010, you can see the buildings continue to rise, with 7 World Trade Center, at the right, already completed. It officially opened on May 23, 2006. 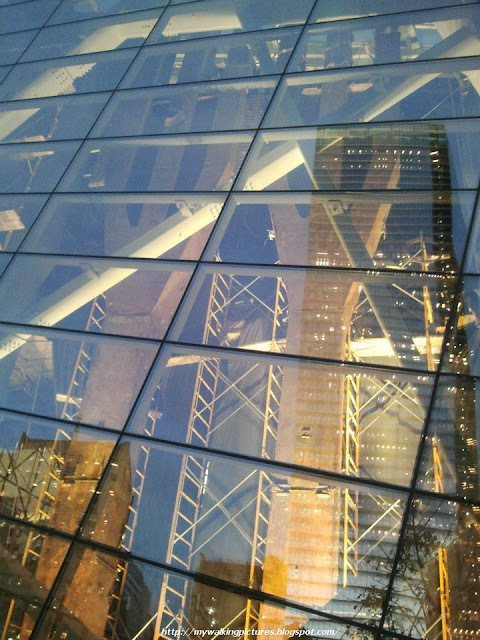 I took this next picture in March 2011 and some of the shimmering glass curtain walls that adorn the building were already in place. On May 2, 2011, President Obama announced the death of Osama bin Laden. I was off that week and went to the World Trade Center site the following day and came upon this poignant scene - a fellow officer paying respects to the fallen, and perhaps offering a prayer of gratitude that justice has been served. A month later, on a foggy June day, the glass walls of One World Trade Center has covered a big portion of the building and it was now as high as 7 World Trade Center. The World Financial Center in Battery Park City offers a great view of the WTC site. 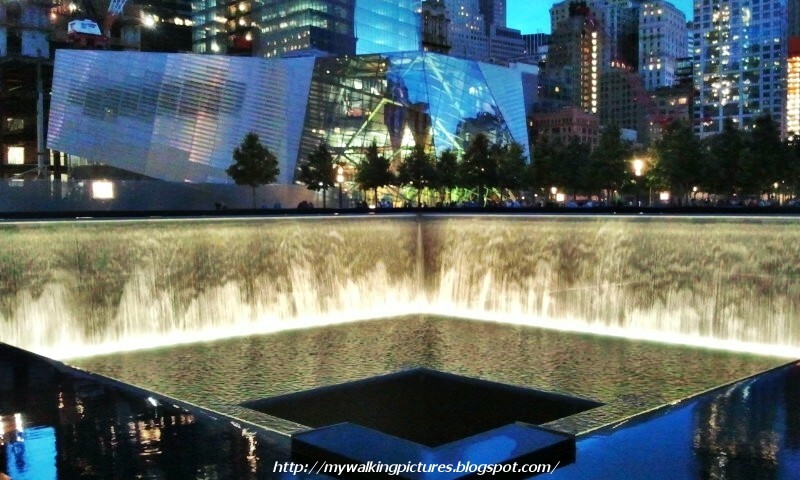 I was there in August 2011 and had a great view of the National September 11 Museum. 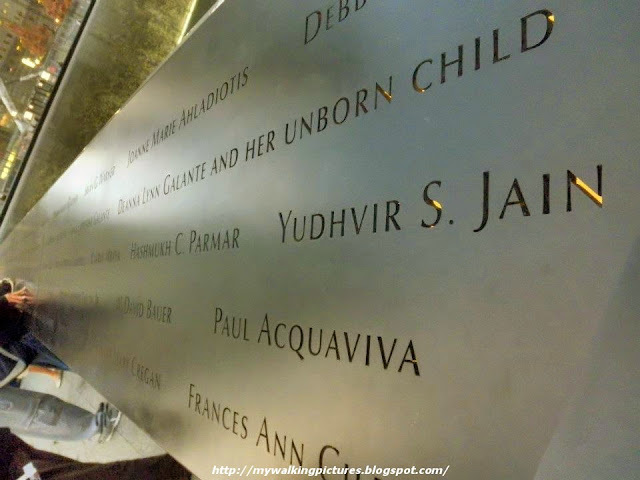 A day before the 10th anniversary of the attacks, I visited the site. 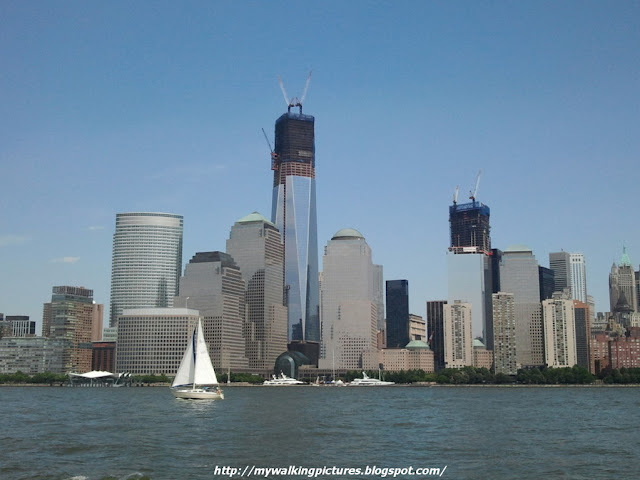 One WTC was standing tall and proud with the rest of the buildings under construction in the site, and all the construction equipment were decorated with American flags. The National September 11 Memorial was open to the public the day after the 10th anniversary and welcomes visitors to a place where we could pay our honor and respect to the victims of the senseless attacks. 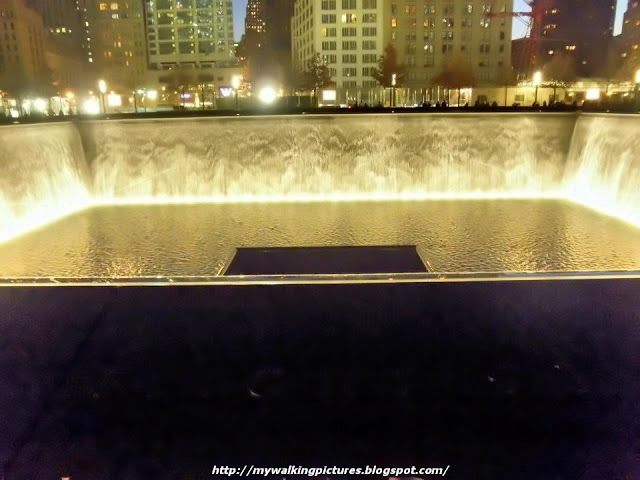 I was able to visit the Memorial in November 2011. I find it so peaceful and calming. I could stay there the whole day and do a lot of reflection. 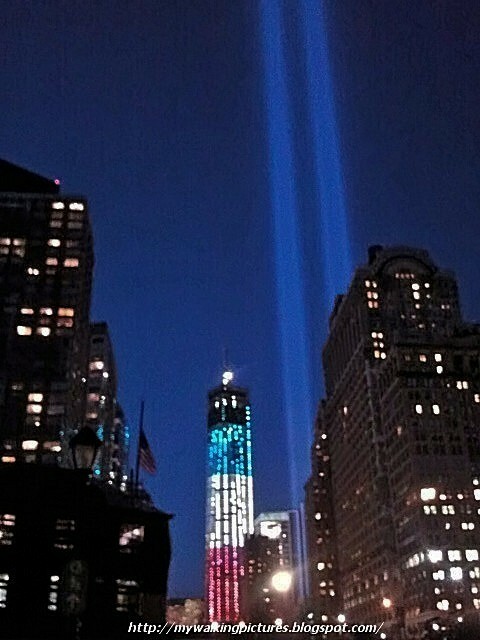 Even the lights at the Memorial are shaped like the towers. The lights of the city add to the beauty of the place at night. 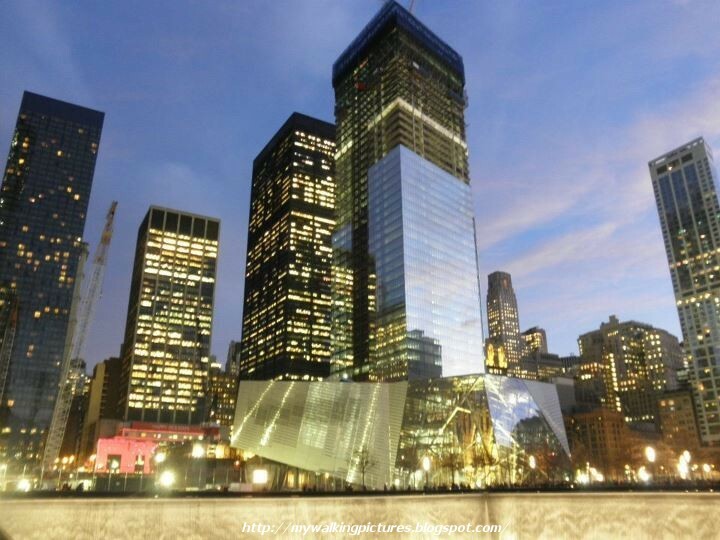 4 World Trade Center can be seen at the back of the Museum. On one hand, seeing these four words "and her unborn child .." is so heartbreaking. On the other hand, seeing the Tridents reflect on the Museum's glass walls gives you the strength to go on and move forward. 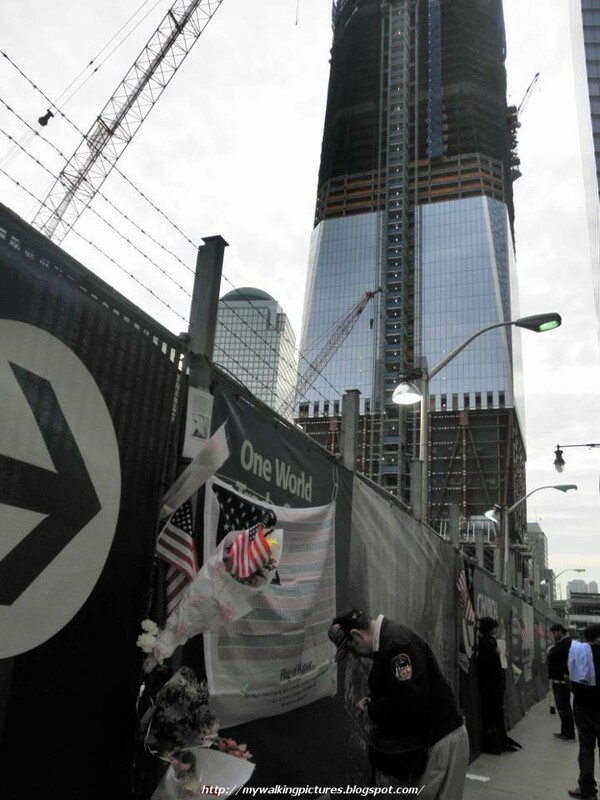 The ‘tridents' are visual references to the towers that once stood at the World Trade Center, Mayor Michael R. Bloomberg said. Installed within the Museum, they will symbolize our resolve to overcome the devastation of 9/11 and signal a hopeful future as they greet visitors to the site. We are proud to be resurrecting the Twin Tower tridents at the World Trade Center, 9/11 Memorial President Joe Daniels said. The tridents will stand as a powerful message of hope and endurance in the face of tragedy, complementing the hundreds of trees that will surround the two Memorial pools. As the WTC buildings continue to rise, I have several opportunities this year to take pictures, especially of One World Trade Center. 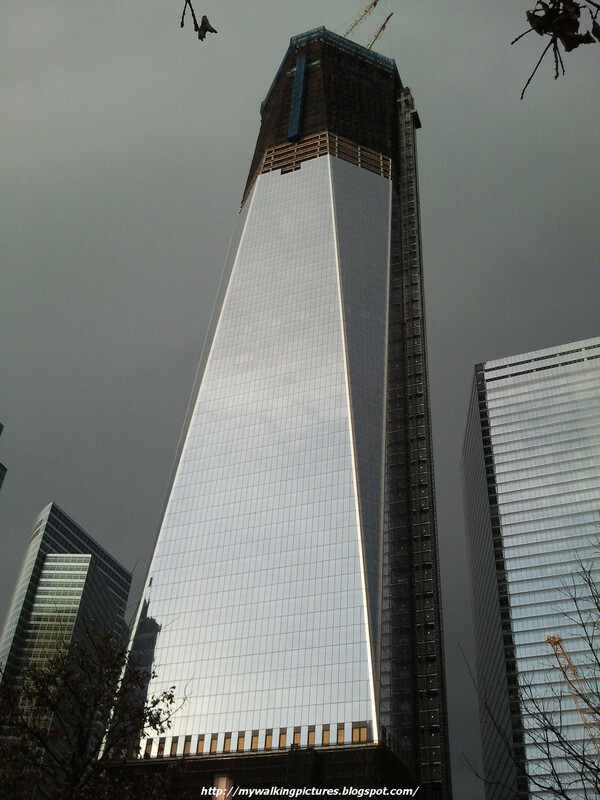 This one was in February when I had the chance to visit the Memorial again. However, a couple of weeks after that I lost my computer, and with it, my pics during the visit. Fortunately, I still have this one pic taken from my phone camera. 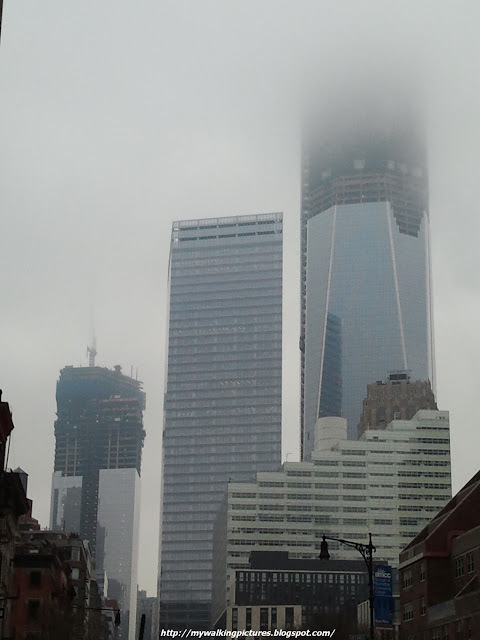 This next pic I took while on a walk in lower Manhattan one foggy morning in March. 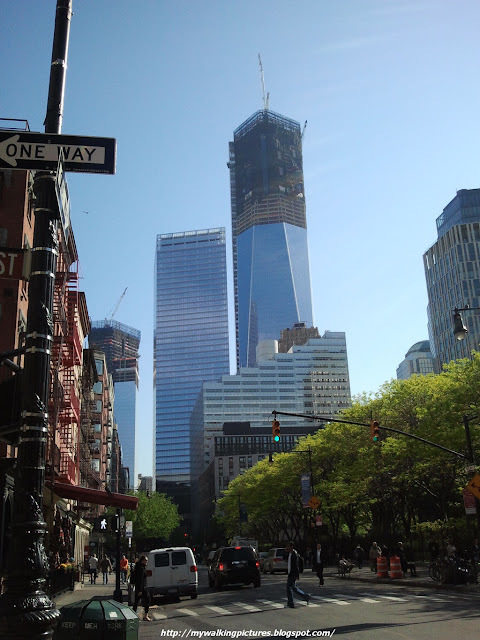 On our way to watch the Journey documentary at the Tribeca Performing Arts in April, we had this view from Chambers Street. 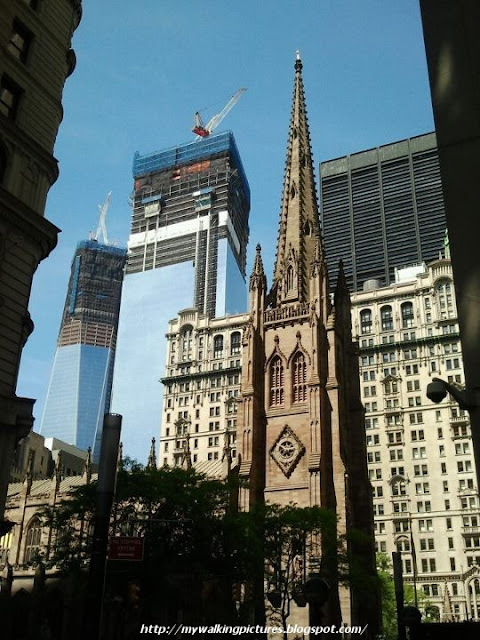 In May, I visited Trinity Church and you can see the WTC buildings in this pic. Despite the site's proximity, Trinity Church (with the exception of its historic pipe organ which was damaged) was unscathed and offered shelter to people fleeing the buildings that fateful day. In June, I had the opportunity to be on board the fireboat the John J Harvey, which I wrote about in a previous blog. 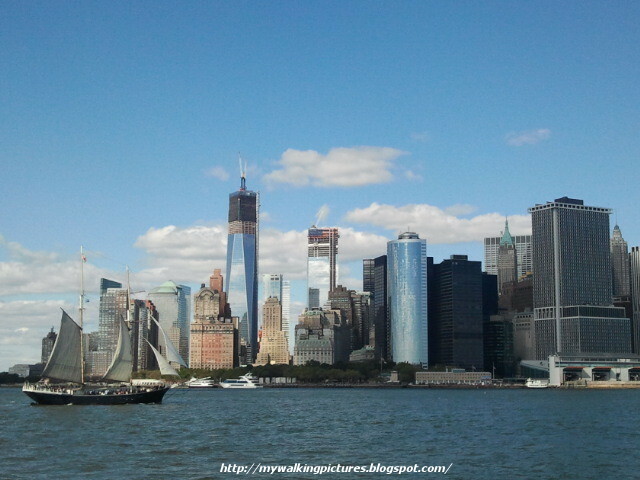 We had a short trip around the Hudson River and had amazing views of the lower Manhattan skyline. The John J Harvey was reactivated on September 11, 2001 and assisted in evacuations from Ground Zero. Alongside FDNY fireboats Firefighter and John D. McKean, she pumped water for 80 hours until water mains were restored. 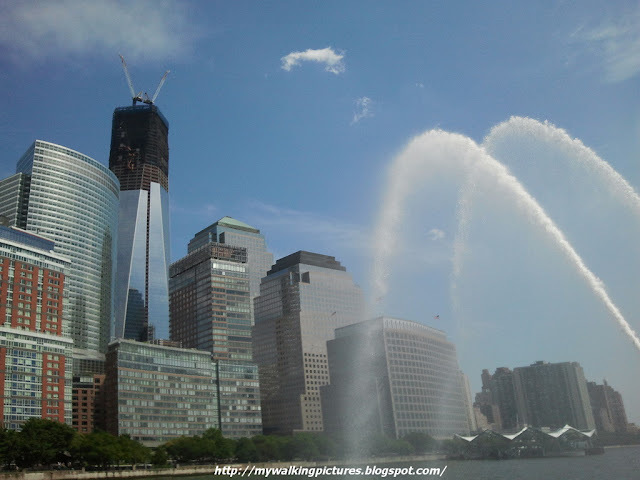 That June day was like coming full circle, with the fireboat pumping water as a salute to the new buildings rising at the WTC site. And this July, I participated in the Ground Up contest on the facebook page of Rockefeller Center and won free tickets to Top of the Rock. It provided an awesome view of the city, and looking south, I saw One World Trade Center saying hello to the Empire State Building. 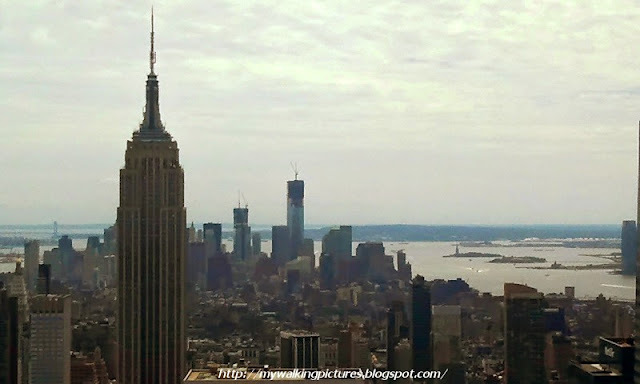 On April 30, 2012. it has surpassed the height of the Empire State Building to become New York City's tallest building. I again visited the memorial the Saturday before the 11th anniversary of the attacks. The grasses and trees in between the two pools were looking lush in the afternoon rain. 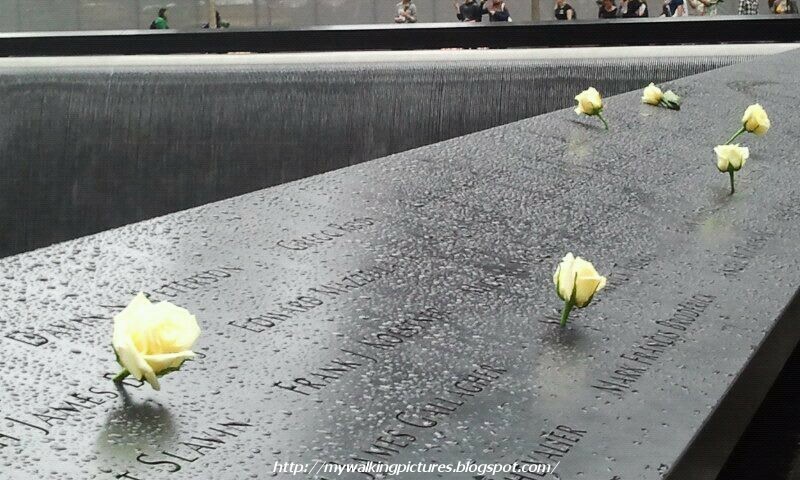 And someone left yellow roses to honor the victims. 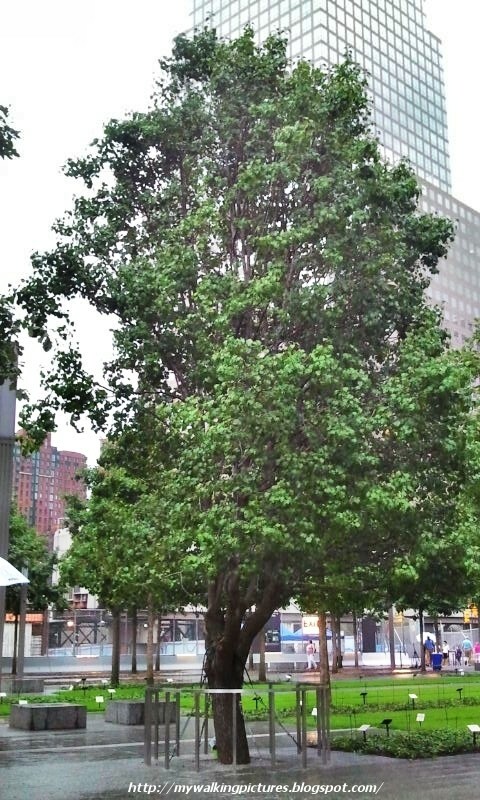 The survivor tree, a Callery pear tree among swamp white oaks in the memorial, is growing tall and is a wonderful symbol of hope and resilience for eveyone. 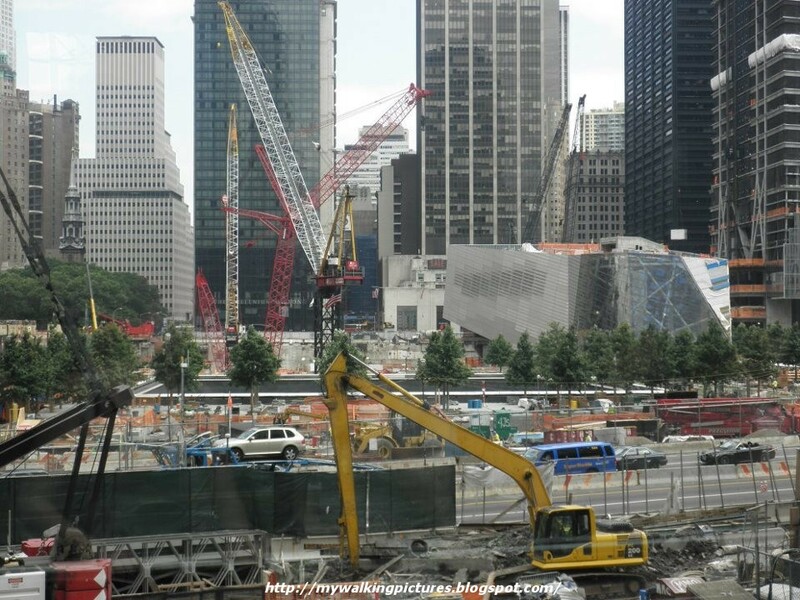 On Monday, it was announced that construction on the National 9/11 Museum will resume, It was scheduled to open on the 11th anniversary of the attacks but was temporarily delayed as construction was halted due to budgetary dispute. Hopefully, it will open to the public soon. 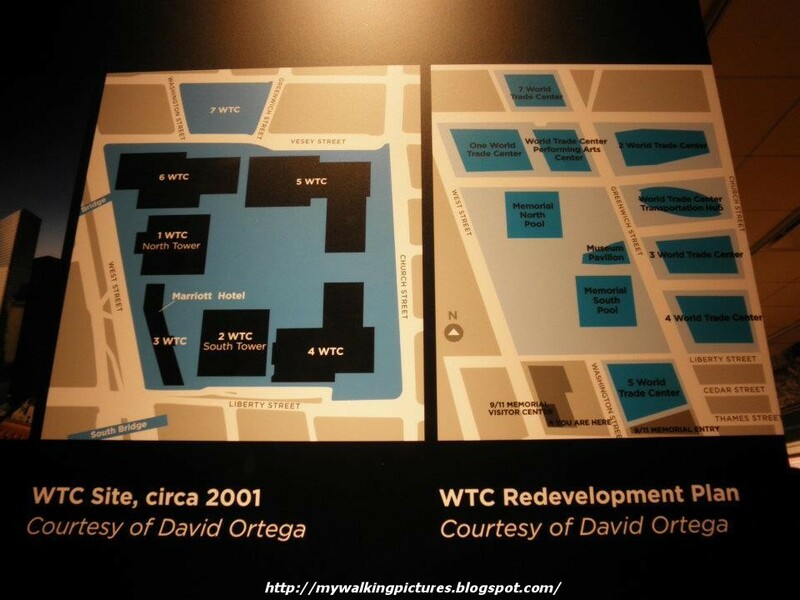 At the temporary location of the museum is this map showing the old WTC site and the new one. 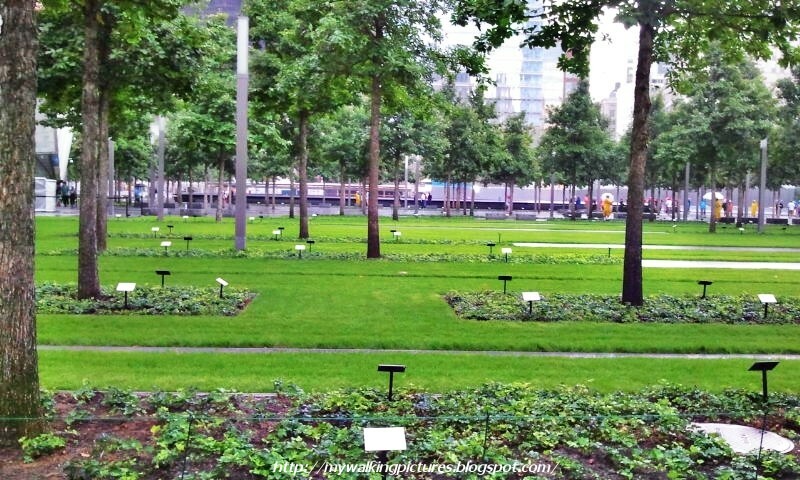 Last Tuesday, on the 11th anniversary of the 9/11 attacks, I was at Battery Park in lower Manhattan. 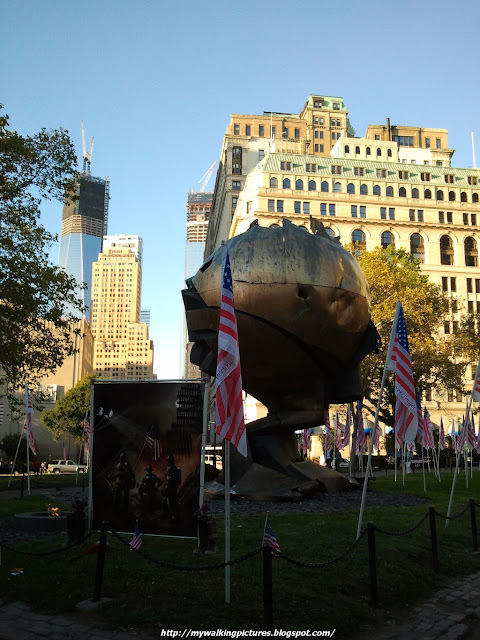 The Sphere, a sculpture which survived the attacks, is temporarily housed there. For three decades, this sculpture stood in the plaza of the World Trade Center. Entitled "The Sphere", it was conceived by artist Fritz Koenig as a symbol of world peace. It was damaged during the tragic events of 11 September 2001, but endures as an icon of hope and the indestructible spirit of this country. The Sphere was placed here on 11 March 2002 as a temporary memorial to all who lost their lives in the terrorist attacks at the World Trade Center. This eternal flame was ignited on 11 September 2002 in honor of all those that were lost. Their spirit and sacrifice will never be forgotten. 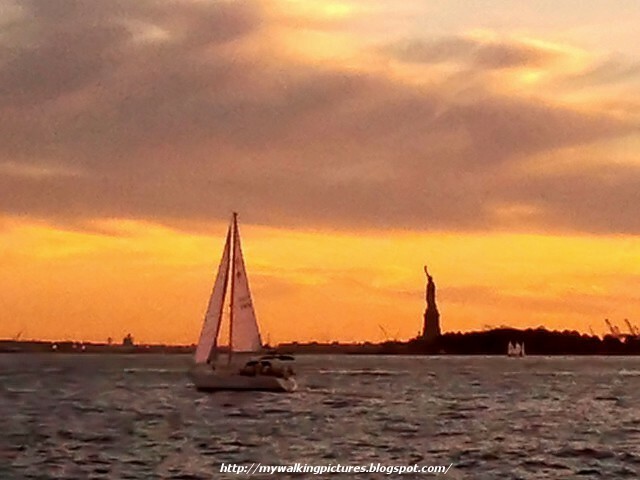 I stayed at Battery Park until sunset, looking at Lady Liberty, another beacon of hope for the American people. 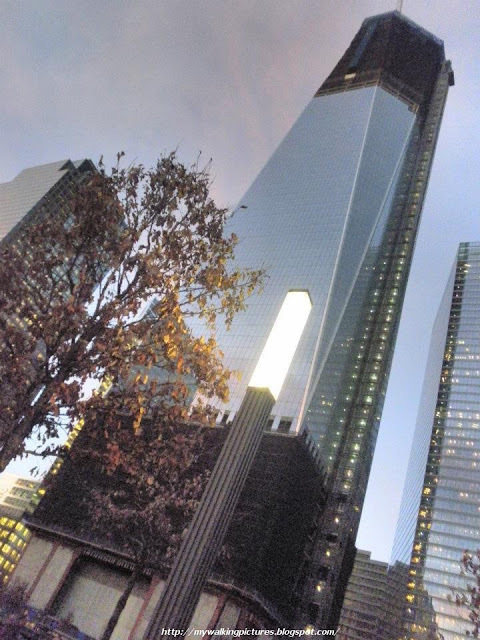 A short while later, I was standing at the same place but looking at the opposite direction and saw One World Trade Center lit in red, white and blue. A little bit nearer is the Tribute in Light, shining brightly on that night. Watching those lights gave me a sense of peace. Yesterday, I was at Governors Island, it is right across lower Manhattan and has amazing views of that part of the city. 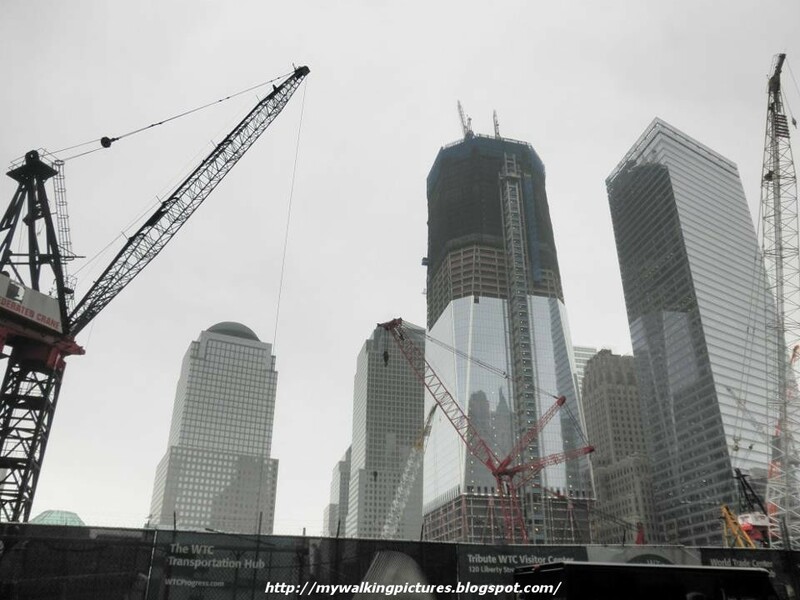 It was so great to see the changing landscape, seeing the WTC buildings rising tall once again, showing us the power of endurance and resilience of a people, and the realization of hope for a better future. 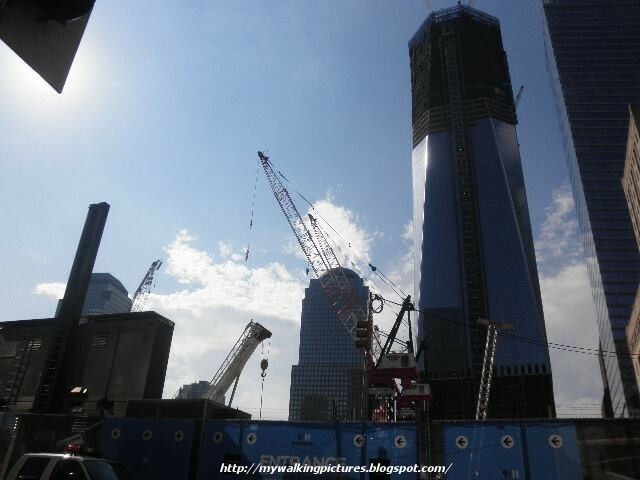 More pics on Rebuilding the World Trade Center on Flickr.